Accessible Technologies, Inc. (ATI) ProCharger was founded in 1994 with a mission to produce a powerful, reliable and efficient supercharger system for a variety of vehicles and engines. Power to the masses one might say. With this goal clearly in sight they charged on to the scene with the first intercooled supercharger system available to the public and street scene. ATI ProChargers were three years ahead of the competition when it came to the intercooled supercharger. ATI’s first supercharger model was the P600B centrifugal charger which outflowed other chargers at the time by up to 65 percent. ProCharger’s first offerings were for the Chevy small block, followed with big block versions and then they ventured into the marine industry. ProCharger has always seemed comfortable blazing new trails and they were the first company to offer a warranty that guaranteed boost levels above 8 psi. Additionally, ATI was the first to introduce a fully self contained, gear driven centrifugal supercharger in 1999. ATI ProCharger has proven their technology and manufacturing prowess time and again in the professional racing scene. ATI was so sure of their racing product that in 1998 they introduced the ProCharger D-1 which was the first racing supercharger that offered a warranty. Over the years ProCharger powered vehicles have tallied roughly 50 national championships in the upper echelons of racing. In 2009 alone ProCharger racked up 12 different international racing championships over eight different racing bodies which included placings in NMRA, NMCA and PSCA. Along with the championships came several broken records by ATI ProCharged vehicles. ProCharger driven race applications, as well as street, continue to dominate in power and efficiency. ProCharger blowers have boasted setups with over 3,000 horsepower on methanol and over 2,500 horsepower on gasoline. ATI has built and continues to build ProCharger supercharger kits for a large variety of applications including carbureted and EFI engines for cars, truck and SUV’s, motorcycle, boats and marine engines and other powersport or off-road vehicles such as ATV’s, snow mobiles and PWC’s. After years in the business ProCharger continues to strive for the best products possible. They offer some of the most efficient superchargers on the market today as well as industry leading warranties. As a closing example of ATI ProCharger’s industry leading supercharger kits, their technology and designs have made such an impact that you can easily browse the net and find examples of people erroneously using the ‘ProCharger’ name as an actual type of supercharger. Weiand Automotive Industries, Inc. assured their place in automotive performance history when in 1937 they developed and manufactured the first aluminum intake manifold available to the mass market. Founded by Phil Weiand in the mid 1930’s the company began in California as Weiand Power & Racing Equipment which was a performance parts warehouse. Their first original product was the ‘High Weiand’ the aforementioned aluminum intake manifold. It wasn’t until 1957 that Weiand began to develop complete blower drives for the GMC 6-71 supercharger. There was no turning back from that point. Weiand continued by producing blowers for several of the most popular platforms through the years. Phil Weiand was an auto enthusiast to the core and his company reflected that. Phil and the company were involved in motor sports the whole way. Weiand products were front and center in many famous dragsters with some big names starting it out like Big Daddy Don Garlits’ Swamprat 1 the Isky-Weiand Special and Lloyd Scott’s Bustle Bomb. In 1963 Weiand Power & Racing Equipment continued to build new roads when they were among the founding members of SEMA (Speed Equipment Manufacturing Association, now Specialty Equipment Manufacturing Association). Phil Weiand lead the company for generations up until 1978 when he passed away. Phil’s wife, Joan Weiand, took over and continued to move the company and industry forward. Under Joan’s lead Weiand introduced a series of Roots type superchargers for popular street applications as well as expanding into the Marine industry. In 1998 the company left family hands when it was sold to Holley Performance, another legend in the industry. Due to their huge impact in the automotive performance industry both Phil and Joan were inducted into SEMA’s hall of fame. Weiand Automotive is a pioneer in the automotive performance industry. Without Weiand’s advancements the level of performance automotive technology, the racing and the street scene would not be where it is today. Through the years the company has been a leader in the industry with their high quality and innovative designs and parts. Although Weiand is a household name in performance it is also a tricky name. Debates over how to pronounce Weiand have happened more than a few times with popular alternatives being ‘Wee-And’, ‘Weigh-And’ and not pronouncing it at all. For the record, according to the family they pronounce it as ‘Why-And’. BLITZ has roots in the 1970’s as a circuit racing team that grew into a high performance tuning shop. The next step for the company was in 1981 when they established BLITZ Co., LTD in Tokyo, Japan. Their focus has been to produce high quality performance products for the aftermarket that can endure the daily grind and still perform when needed. While maintaining that focus BLITZ has been able to expand by distributing parts internationally. In 1997 BLITZ expanded into the North American Market with a partially owned subsidiary BLITZ North America Inc. 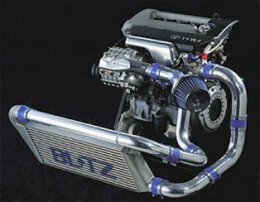 BLITZ has a large range of performance parts and has become a serious player in the tuner market. They continue to hone their high performance parts using real world street car and professional racing results. TEAM BLITZ has been racing in the D1 Grand Prix Series since 2002 with some strong results. BLITZ has some great superchargers kits available for the tuner market. Toyota Racing Development (TRD) is Toyota’s in-house performance development and tuning division for Toyota, Lexus and Scion vehicle lines. At the time of writing there are two main divisions of TRD: Toyota Technocraft Co. Ltd or TRD Japan (established June of 1954) and TRD U.S.A. (established in 1979). TRD Japan was originally known as Toyota Sports Corner (TOSCO). In December of 2006 TRD officially expanded into Thailand with TRD Asia Co. Ltd. which was a new corporation made up with 80% shares owned by Toyota Technocraft Co., Ltd. and 20% by Toyota Tsusho Corporation. In August of 2007 Toyota Australia established TRD Australia which offered the first TRD production vehicles. Unfortunately the production was officially brought to a halt in March of 2009. Beyond superchargers TRD offers several optional and aftermarket performance parts including headers, mufflers, suspension parts, braking hardware and much more. – The Japanese division of TRD has raced in a variety of series including: All-Japan F3 Championship, ESSO Formula Toyota, Netz Cup (Vitz) and Super GT (JGTC). – TRD U.S.A. has been raced in Baja 1000, Championship World Series (CART), Championship Off Road Racing (CORR), Grand-Am Cup Sports Touring, Indy Racing League, International Motor Sports Association (IMSA), NASCAR Craftsman Truck Series, NASCAR Sprint Cup, Nationwide Series, National Hot Rod Association (NHRA) and Toyota Atlantic Series. – Toyota Team Europe which is now known as Toyota Forumla One Team has raced in 24 Hours of Le Mans, Forumla One World Championship Racing (F1) and World Rally Championship (WRC). A couple of noteworthy achievements: TRD was the first to factory fit an Eaton TVS supercharger in a production car with the 2008 TRD Aurion. Also, in 2000 Toyota was able to grab a CART win with a TRD built engine. This was the first American built engine to win an Indy race in 20 years. Using that same design by 2002 they were able to take the Indy Series Championship. Unfortunately, in 2015 Toyota discontinued support for the TRD Supercharger program. The majority of their offers were Roots type but they also had a centrifugal compressor for the Scion.